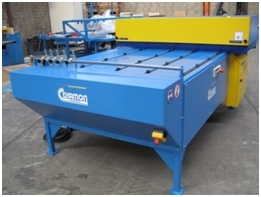 Cekamon endsaw m - Demands and Offers for wood and wood products. ID 468109 CE certificated by a so called Notified Body. Can be installed straight behind the palletSaw. One person does the dismantling and the second the cross cutting. Can be installed without any special facility. Boards will be sorted by length on a not motorized sorting rack. CE certificated by a so called Notified Body.